In this delightful tapestry, we see a game of skittles of European bowls being played in a village setting in a Belgian countryside. 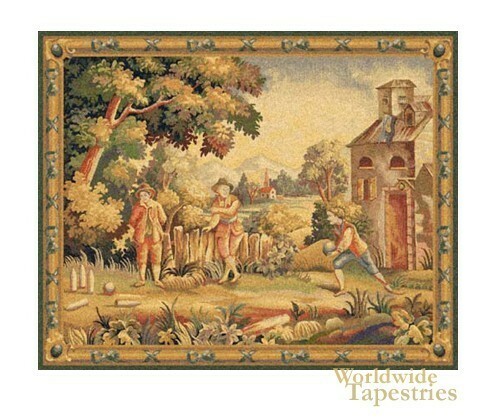 The idyllic forest background and the traditional attire of the villagers sets the scene of this verdure tapestry, which includes man made elements as well as that from nature. In this scene, we see the flag flying on the rooftop, a symbol of the festive nature of this game. This tapestry is lined and has a tunnel for ease of hanging. Dimensions: W 39" x H 33"